We are an organization covering the counties of Cornwall, Devon, Somerset and Dorset, bringing together like minded people with a love of sewing. Our membership at present exceeds 500 and the majority of our members belong to a patchwork and quilting group local to where they live. We come together en-mass three times a year, spring, summer and Christmas. These meetings are always very enjoyable with home grown and international speakers, show and tell, trade stands and plenty of meet and greet with friends old and new. We publish our own magazine four times a year which keeps us all in touch with each other and lets us know what is happening in the region. There are many exhibitions put on by local groups and workshops held, at very competitive rates, in all the counties. A little of what we have to offer is on show here, we hope you enjoy it. Should you wish to speak to someone or join us then please do not hesitate, you can get in touch through the contacts page. The world of patchwork and quilting is a very generous one where people share time, friendship, advice, fabric and cake. Come and join us. click here and select ‘chairman’ to contact Jenni. We would like to welcome new members to the friendship and fun of joining South West Quilters. As a member you will receive four magazines a year, and able to join in any of our special get togethers. – AGM- Spring , Summer, and Christmas Meetings. The Spring Exhibition , held at Westpoint, Exeter, displays, quilts made from our various areas by kind permission of Grosvenor Shows, alongside all that a quilt show can offer. There will be a wide range of workshops on offer, throughout all areas – Cornwall, Devon, Somerset and Dorset. 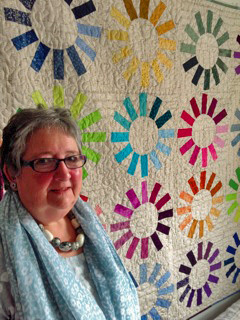 South West Quilters welcomes the coming together of folk with a common love and enjoyment of thread, stitch and fabric.